Security of energy supply is at the top of Japan’s political agenda, especially in the aftermath of the country’s 11 March 2011 triple disaster. Having virtually no domestic energy resources and a renewable market still in its infancy, Japan is the world’s largest net oil importer. Since the first oil shock in 1973 and until the 2011 disaster, nuclear power has been a key pillar to reinforce Japan’s energy resilience against oil market fluctuations and to mitigate climate change. However, in the wake of the disaster all of the country’s 50 nuclear reactors, which account for a total of 47 gigawatts (GW), were gradually shut down for safety inspections or maintenance. As a result of public pressure it is uncertain on the short-term whether or not these units can be put back online. To avoid potential blackouts and overcome this drastic cut in nuclear energy, the share of fossil fuel-based power increased by 25 percent in 2012, which threatens economic stability and environmental sustainability. Japan is therefore at an impasse. The country needs to move towards a long-term reliable and affordable energy strategy that guarantees security of supply, powers economic growth needs, supports climate change mitigation policies and ensures the public’s trust. And yet the roadmap to reach this goal is unclear. The dilemma remains: can the government reach a turning point and switch to a green and resilient economy based on endogenous and renewable energies? In the national debate regarding whether or not Japan should phase-out nuclear power and which alternative sources should replace it, two antagonistic views persist. On the one hand, the central government, pressured by industrial lobbyists (part of the so-called ‘nuclear village’), supports restarting the nuclear reactors, claiming that nuclear power is the only option able to affordably cope with economic needs, especially given short-term supply constraints. On the other hand, local governments and public opinion call for increasing the share of renewable energies. They see the current challenge as an opportunity to move towards a green economy, which would bring climate resilience, regional development, green jobs and reduce the country’s energy dependence on imports and power monopolies. However, renewable energies are still costly and their technological maturity is yet to be fully developed. So the dilemma remains: can the government reach a turning point and switch to a green and resilient economy based on endogenous and renewable energies? If so, what is the optimal electricity generation mix that would maximize economic and environmental co-benefits? Aimed at clarifying these questions, our recent paper focused on the potential economic and environmental co-benefits of different electricity generation portfolios in Japan in the post-Fukushima Dai-ichi accident context. Adopting a life cycle assessment approach, we estimate global and local environmental impacts, measured as cumulated non-renewable energy consumption, greenhouse gas (GHG) emissions (CO2e), terrestrial acidification potential (SO2e), and particulate matter formation potential (PM10e), as well as generation costs of different electricity matrixes. The study, published in the Energy Policy Journal, assessed four scenarios, taking into consideration current information on the distribution of nuclear energy and renewables, which lie at the centre of the on-going discussion about Japan’s energy future. The first scenario, “Zero Nuclear, High Thermal” considers a setting in which all nuclear power plants are offline and their share is compensated with an increase in thermal power, particularly heavy fuel oil and liquid natural gas. These shares are based on the Institute of Energy Economics of Japan’s estimations about increase in fossil fuel procurement in 2012, and reflect to a large extent the state of affairs of the Japanese energy mix until 1 July 2012 when the two Ohi reactors were restarted. 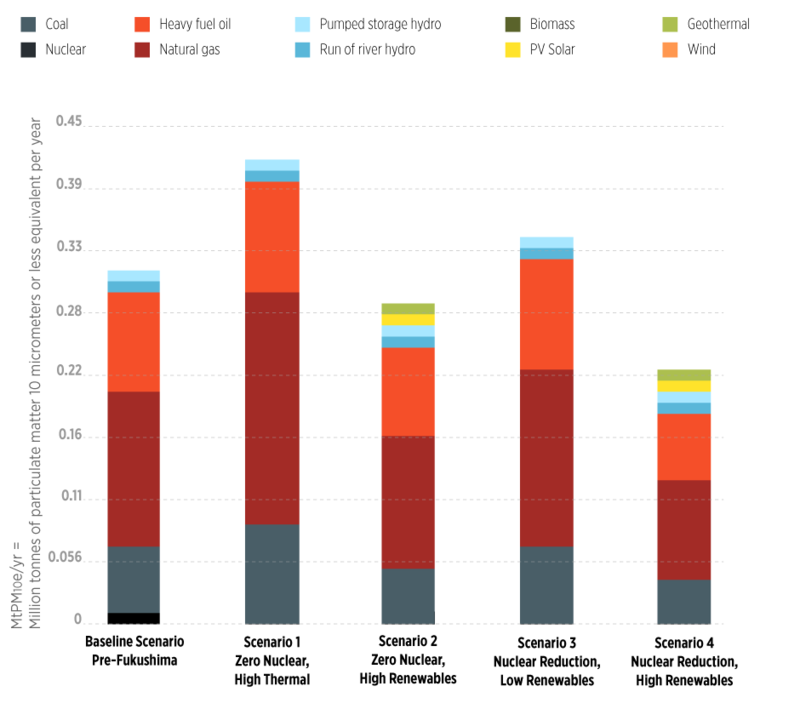 The second scenario, “Zero Nuclear, High Renewables” assumes that the nuclear share is compensated instead by an increase in renewables with a decrease in fossil fuel thermal power. Based on estimated potentials for each energy source by the Agency for Natural Resources and Energy, wind power share is estimated at 6 percent of generated output, followed by solar power with 5.6 percent, geo-thermal power with 2.8 percent and biomass with 2.10 percent. Table 1. Japanese energy mix scenarios in 2030 (generated electricity). We found that if the Japanese government returns to the pre-Fukushima electricity generation mix (baseline scenario), the total non-renewable energy consumption and GHG emissions would be 136 Mtoe and 352 MtCO2e, respectively, and local environmental impacts would range between 0.8 MtSO2e and 0.3 MtPM10e. 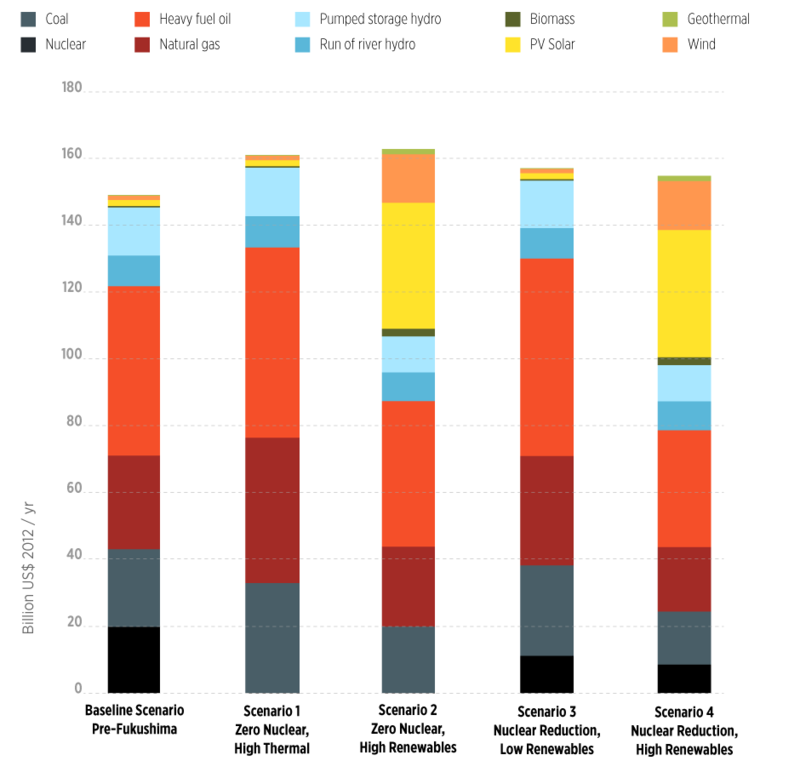 Among alternative scenarios, scenario 1, “Zero Nuclear, High-thermal”, and scenario 3, “Nuclear Reduction, Low-Renewables”, reveal the highest global and local environmental impacts. This suggests that even if nuclear power is reduced and substituted by renewable energies, but fossil fuel thermal share in the energy mix remains constant, the overall local environmental impacts of the electricity sector will not change. Scenario 2, “Zero Nuclear, High-Renewables”, on the other hand, results in 17 percent drop in non-renewable energy use and a 27 percent decrease in GHG emissions. 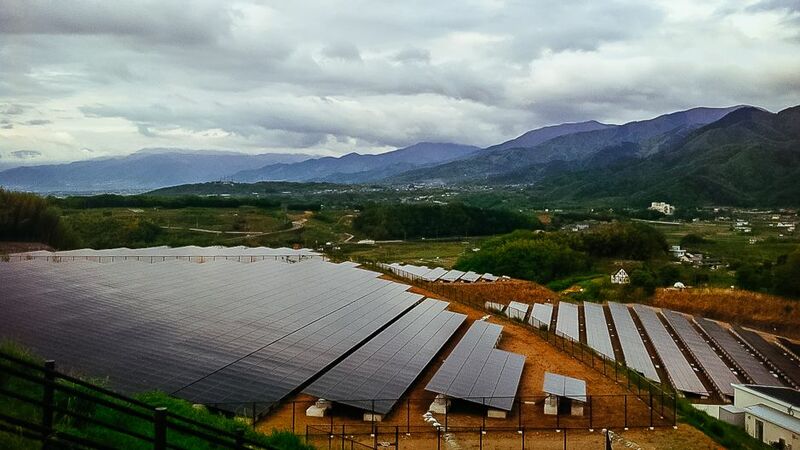 However, this is the most expensive alternative, increasing cost by 9 percent up to US$163 thousand million, mainly as a result of the high capital costs required to implement renewable energy technologies. Scenario 4, “Nuclear Reduction, High-Renewables”, suggests a significant reduction of environmental impacts, as terrestrial acidification potential and particulate matter formation fall by 24 percent. Thus, only if fossil fuel dependence and nuclear power share are simultaneously reduced, environmental impacts will be mitigated. Also, scenario 4 turns out to be a cheaper option. 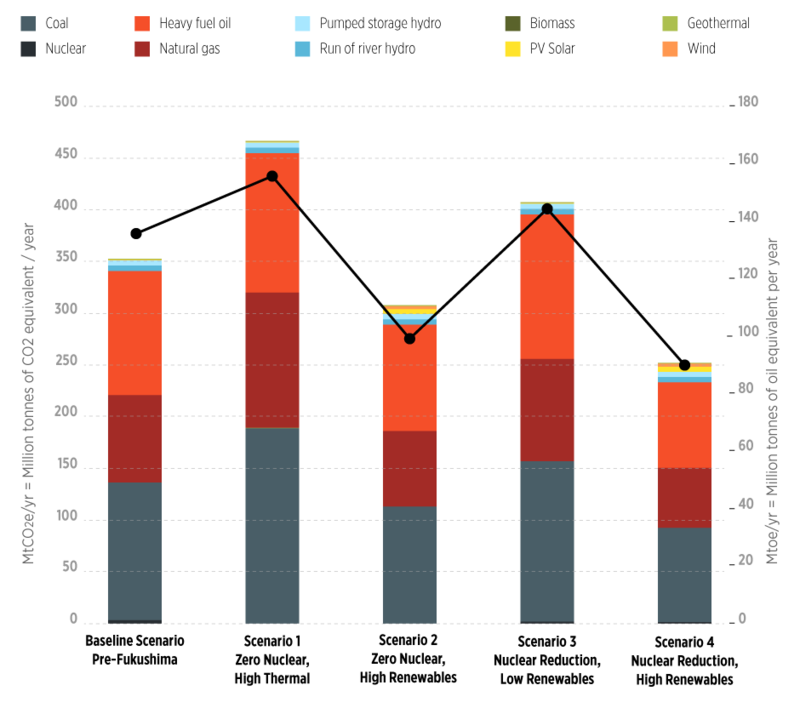 This is mainly a result of high fossil fuel costs, suggesting that by the year 2030, a high renewables scenario could be competitive with a high nuclear scenario such as the baseline case. This makes it feasible to provide a cost-effective solution to energy supply security and climate change, without undermining economic development. It is important to note that project costs do not necessarily indicate the economic liability of a venture, but rather the comparison to other alternatives. In this study the contrast of diverse scenarios helped to reveal the economic feasibility of a potential change. Figure 1. Cumulative non-renewable energy consumption and Global Warming Potential of proposed scenarios (2030). Figure 2. Terrestrial Acidification Potential of proposed scenarios (2030). Figure 3. Particular Matter Formation Potential of proposed scenarios (2030). Figure 4. Levelized costs of proposed scenarios (2030). A bright future and back to the dark past? The Japanese government will soon be announcing crucial policies to draw the future energy path of the country. As demonstrated in this study, the government of Japan has the potential and capacity to turn the current energy crisis into an opportunity and move towards an environmentally friendly and economically competitive electricity generation mix. In the authors’ view, the short-term strategy followed by the Japanese government of idling nuclear power and substituting it with fossil fuel technologies (as modelled in scenario 1) is not sustainable in either environmental or economic terms, as it bumps cumulative non-renewable energy consumption up by 14 percent, GHG up by 32 percent, terrestrial acidification potential up by 29 percent, and particulate matter formation up by 34 percent. Finally, it is 8 percent more costly than the pre-Fukushima baseline scenario. On the other hand, due to infrastructure and technical constraints, an immediate transition to renewable energies is not realistic in the short-term. In that sense, taking into consideration the public sentiment toward nuclear power and the economic and environmental implications of fossil fuel use, a reduced share of nuclear energy is the optimal choice. However, given the public distrust in the nuclear regulatory institutions, the Japanese government should ramp up its efforts to guarantee the safety of its nuclear reactors up to global standards of safety, public health and welfare, and reform the regulatory system as recommended by the Investigation Committee on the Accident at Fukushima Nuclear Power Stations of TEPCO. It would be essential to control the recent Fukushima crisis related to the water leakage and potential contamination and soil and water surrounding environments. In the mid/long-term, a shift from non-renewable resource dependence to endogenous energy sources might prove a successful strategy on environmental and economic terms. In that sense, the transition might be achieved from either nuclear power generation or renewables, as both energy systems are cost-effective alternatives to reduce foreign energy dependence, GHG emissions and other local air pollutants at an affordable cost. 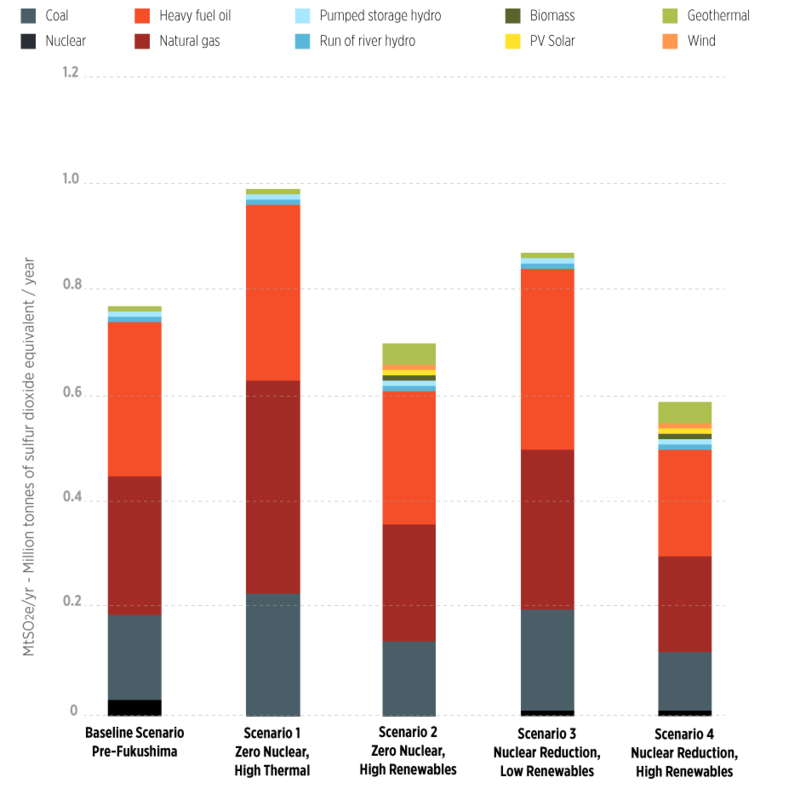 As demonstrated in scenario 4, “Nuclear Reduction, High Renewables”, an incremental share of renewables, together with a reduction of nuclear power and fossil fuel thermal technologies, would result in 29 percent savings in non-renewable energy consumption and a decrease of 34 percent in GHG emissions, and of 24 percent in terrestrial acidification potential and particulate matter formation. Though when compared with the base scenario, generation costs are indeed higher, these costs might also be understood as an internalization of environmental externalities. Joana Portugal-Pereira is a Research Fellow at the Federal University of Rio de Janeiro (COPPE-UFRJ), Brazil. Her research interest focuses on evaluating the cost-effectiveness of mitigation strategies to reduce the global and local environmental impacts of the energy and transport sectors. Prior to joining COPPE-UFRJ, Portugal-Pereira developed consulting and research work on sustainable mobility, low carbon technologies and sustainable energy systems for the UNU Institute of Advanced Studies and the Asian Development Bank Institute (ADBi, Japan). A Portuguese national, she holds a master’s degree in Environmental Engineering with specialization in bioenergy from the Technical University of Lisbon, and a Ph.D. in Urban Engineering from the University of Tokyo, with emphasis on alternative fuel life cycle assessment. Bernardo Castro-Dominguez is a researcher at the University of Tokyo, Japan. His research interest is related to the development of membranes and molecular sieves for the separation of gases. Other research activities include the techno-economical evaluation and optimization of chemical processes. He holds a master’s degree in Chemical Engineering from the University of Utah with specialization in Process Design and a Ph.D. from the University of Tokyo with emphasis in membrane development. Giancarlos Troncoso is trained as an architect and an urban planner with expertise on urban transportation planning, particularly on issues related to the built environment and travel behavior. He holds a master’s degree in urban planning from the University of Tokyo and is currently a Ph.D. candidate at the same university, where he develops econometric models to analyze the impact of the built environment, attitudes and preferences on travel behavior. Need to fix and check Fig 1. Right side has the wrong label on it. Should be: Mtoe/yr but don’t know what it stands for. Anyone have a clue? Fi,.3 also need a correction: What is MtPM10e/yr ? I need to check the description of scale for this figure also. Change Rebewables to Renewables throughout the graphics. I think “Scenario 3” in figure 1-4 supposed to be “Nuclear Reduction, Low Renewables” since there are some proportion of Nuclear in the bar. If it is not the case, Japanese version will follow as it is. Thanks for catching that, Asako. We will update the graphics.